Aphids, otherwise commonly referred to as plant lice, are an invasive nuisance that can attack and destroy many of your plants. So why are these minute creatures so devastating? They reproduce at an alarming rate. By the time you notice aphids on your plants, you may already have developed a small infestation. Unfortunately, even a small infestation can rapidly turn into a massive concern for your plants in a matter of a few days. How Can You Tell if Your Plants Have Aphids? Often the best way to determine if you have aphids in your garden is visual confirmation of either their physical presence or evidence they have recently been there. The first thing to check for is the aphids themselves. They are extremely small mostly under 6mm in size and can range in colors including green, yellow, brown, red, and black. If you don’t physically see any, check the plant for aphid damage such as yellowing or curling leaves which can be caused by the aphids sucking out nutrients from the plant. In more severe infestations you may notice distortion or loss of new plant growth shoots. One final way to check for the presence of aphids is by finding signs of their excretions which is referred to as honeydew. While the honeydew may be hard for you to notice without knowing exactly what you are looking for, you will be able to identify the presence of sooty mold referred to as black fungus which occurs as honeydew sits on the plant for some time. Sooty mold can damage your plant by blocking the sunlight it needs, but it can be easily washed off when detected. Why Aphids Can Be So Dangerous for Your Garden? Direct plant damage – Aphids feed on the phloem sap of the plants which not only weakens the plants but can cause a metabolic imbalance which can lead to leaf distortion and even leaf loss. Not only do they take from the plant but they also put their own toxins into the plant causing the plant’s development to be altered. Indirect plant damage – As mentioned above, aphid excretion can lead to black fungus. If not removed immediately, this fungus will stop all of the light hitting the plants, leading the plant to fail to thrive and even die from lack of sunlight. Virus transmission – One of the most problematic and harmful damage that aphids can cause is the transmission of viruses from the affected plant to new and healthy plants in your garden. Unfortunately, once the winged generation of aphids has grown on the affected plant, they will be able to transmit the virus rapidly to surrounding plants in a matter of moments. Unfortunately, these viruses cannot be remedied if the plant is not tolerant and can lead to the progressive destruction of your garden. When you use chemical pesticides in your garden, the chemicals will often travel through the plant and out to the tips of the leaves which is where aphids prefer to congregate. To be most effective it is important to utilize a formula that is long-lasting and is made to absorb into the vascular system of the plant and circulate through to each part. It is important to note that chemical pesticides may not spread as well to the leaves of all plants so keeping an eye out for aphids is still vital.If you have detected the presence of aphids and want to quickly get them under control, you can apply some insecticidal soap to your plants. Be sure that you utilize the soap on a regular basis until they are removed as their reproduction can get out of control rapidly. Remove weeds from your plants as these are hiding grounds for adult aphids and eggs. Avoiding over fertilization with nitrogenous fertilizer which can attract aphids. Netting your plants with insect nets to protect them while developing. There are also biological techniques you can use when creating your garden to prevent them from attracting aphids. To start with, choose plants for your garden that can attract insects that are not damaging and are natural predators of aphids. You can attract many aphid predators by planting flowers such as marigolds, sunflowers, daisies, alyssum, dill, and calendula. Another simple way to repel aphids through the use of their natural predators is by introducing these beneficial bugs into your garden yourself. 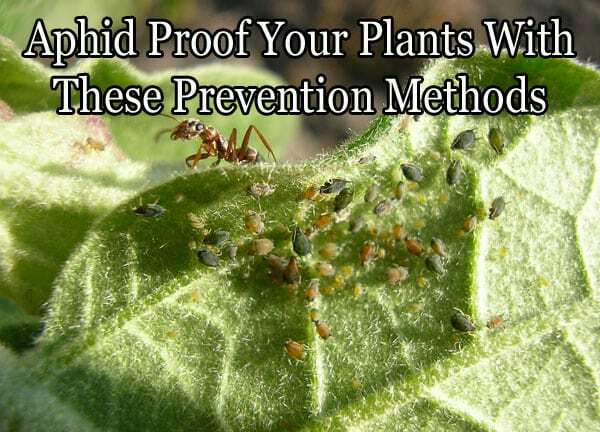 This easy method helps prevent aphid infestations without chemicals and can enhance the natural surroundings of your garden. Two of the most common aphid predators are ladybugs and lacewings. The lacewing larvae can be particularly voracious predators to aphids as well as a number of other insects that can damage your garden. You can purchase both live ladybugs and green lacewing eggs online and introduce them to the areas of your garden where you suspect the most risk of an aphid infestation. You may also want to try to create a barrier around your garden for additional protection. This can be done by surrounding your garden with plants that are resistant to the viruses that aphids can spread. This not only prevents the virus from spreading but also creates a physical barrier between the aphids and your more vulnerable plants. If you are worried about your garden being affected by winged aphids specifically, it may be most effective to set traps in the air and along the ground in your garden. Yellow sticky traps will be most effective in the air, and you can create a ground aphid trap with a yellow plate containing soapy water. The yellow will attract the aphids, and the trap will do the rest. A simple way to keep aphids at bay is to regularly spray down your plants with a steady stream of water from your garden hose at least once every two or three days. The water pressure will knock current aphids off of the leaves, and any fungus that has grown from their excretions will be removed. No matter what method will work best for you, keeping aphids off your plants and out of your garden will help keep your plants thriving throughout the spring and summer months.